From the time I was 10 or 11 years old, I have been crazy about flying and airplanes. I read and studied everything I could about flying and aviation. My father began taking flying lessons in 1971 and got his private pilot license that same year. When I was 12 years old in 1972, I began flying with him sitting on a cushion in the right seat of a Cessna 172. Being able to fly with my dad and around the airport just increased my passion for aviation. 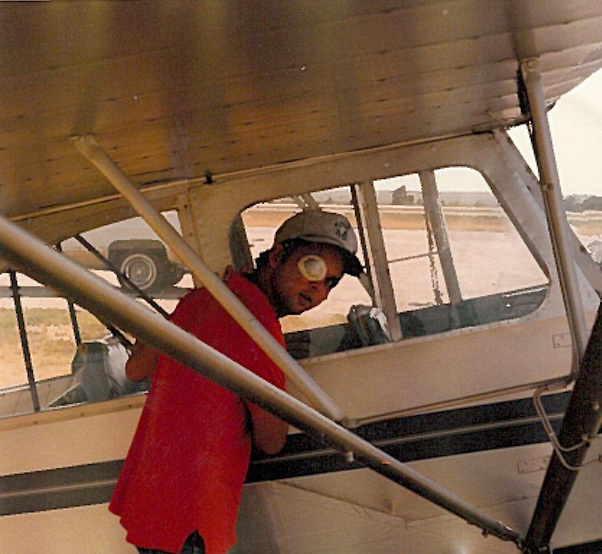 When I was about 14, I began taking formal flying lessons in our 172 at our local airport in Cleburne, Texas. On my 16th birthday, I soloed. Like anyone who soloed at such a young age, I was very excited. I finished up instruction and got my private license when I was 17. Through the next few years, I completed my instrument, commercial and multi- engine ratings. After high school, I began junior college and was fortunate to have a friend who was flying a Beech 200 King Air that for insurance purposes, was required to have a co-pilot. I flew with him for a time and was at our local airport one day when the airport manager told me there was a Rio Airways Twin Otter was coming in and did I want to go and marshal the airplane to parking. Rio was the airline that I had wanted to fly for, for a long time. It just so happened I was wearing a ball cap with the Rio Airways logo on it! After the airplane was parked, the owner of the airline that got off. He saw the Rio cap I was wearing and we struck up a conversation. Seeing an opportunity, I of course asked for a flying job. He asked me about flight times and such, and after telling him, he said that I didn’t quite meet the minimums for being hired. However, he said to send him a resume and he would see what he could do. In one week, I got a call from the chief pilot — he said, “I don’t know you, but I have a note on my desk to hire you.” That was in October 1984. I completed ground school and flight training and began my airline career in a DHC6-300 Twin Otter First Officer. I can’t put into words how excited I was. Coming home from a late trip ironically with my same friend who I flew the King Air with he fell asleep at the wheel. I was looking away at the moment, and didn’t notice that he had fallen asleep at the wheel. By the time I looked up, we had missed a curve in the highway, hit a culvert, became airborne and hit an electric pole. I was ejected through the windshield. I remember being on the ground after it was all over. It was about 12:30 a.m., and fortunately someone saw the accident. The ambulances came and I was flown via CareFlite flew me to a hospital in Fort Worth, Texas. The injuries that I sustained were serious, but in my mind the worst was the loss of my right eye. Ten days later I was sent home with my jaw wired shut, over 1,000 stitches and a slight injury to my wrist. Needless to say, my flying career was over, or so I thought. The FAA calls the eye loss “losing a member.” This required me to surrender my medical certificate, which was devastating. During the following year, I recuperated and began to try to get my life back in order. I began doing some research to try to gain reinstatement of my medical certificate. What I found out, to my surprise, that this was not a “show stopper” on medical reinstatement. At this point, I still thought airline flying wouldn’t be possible. After talking with the FAA, I completed the required paperwork and was told it would require a checkride for reinstatement of my second class medical. Second class medical … wait a minute, I could fly commercially with a second class? Still thinking the airlines wouldn’t take me, I called Rio Airways and asked if I could come back to work as a ground school instructor, scheduler or whatever I could do. They advised they had nothing like that for me to do at that time. Tom C. Reynolds began taking flying lessons when he was 14 years old and soloed in 1991 at the age of 16. He received his private certificate when he was 17; however, after a devastating car accident at age 25 he lost his right eye and his dreams of becoming a commercial airline pilot were over — or so he thought. I was completely stunned. I couldn’t even fathom that this would be possible. I asked, “you know what happened to me right?” He said, “if the FAA says you can fly, we don’t care that you’ve lost an eye.” I guess it goes without saying that I said yes. I went back to ground school and got re-qualified and began flying for the airline again. At this time I still had commercial, instrument and multi engine ratings. Keep in mind, I had a second class unrestricted medical certificate. About six months later I took another check ride with the FAA and received my first-class unrestricted medical certificate. Along with the medical, I also carry a “statement of demonstrated ability” or SODA. I stayed with Rio until just before they went out of business. I flew for other airlines through the next few years where I got my Airline Transport Rating. The last airline I flew for was Lone Star Airlines here in Texas flying the Dornier 328 turboprop. At Lone Star, I became a ground school and simulator instructor, and eventually fleet manager. Just before Lone Star’s bankruptcy, I was hired by Friendship Simulation in the Netherlands, to be director of training for their center they were opening in Texas. While there I became a Designated Pilot Examiner on the DO-328. Later, the DO-328 simulator was added at the sim center in Dallas where I became an instructor and examiner on it also. I have been a long time EAA member along with an IAC membership. During my year of recuperation, my family bought a piece of property and we built a small grass runway. Thinking I might not commercially fly again, we bought an Aeronca 7AC Champ. After my medical was reinstated, I began flying the Champ — a lot! I have flown many different airplanes, about 30 different types. A few years later, the little grass airport was sold to Glenn Frick, retired Air Force colonel and competition aerobatic pilot. 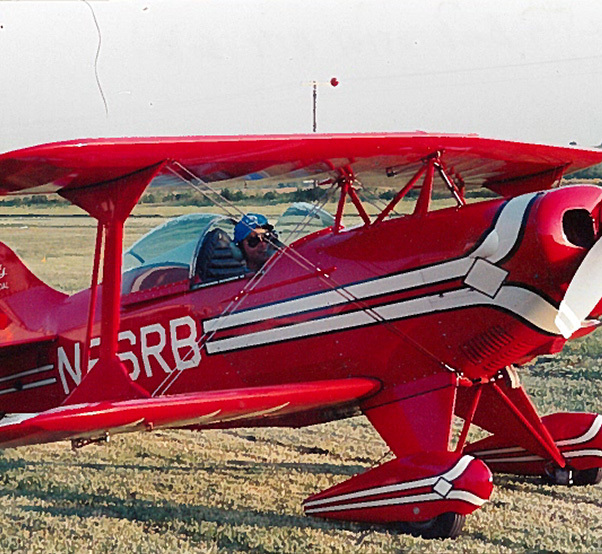 In 1991, I bought a Pitts S1S to fly with Glenn and the other aerobatic pilots on the airport he bought from us. I had some good teachers in that airplane: Glenn, Dan Clark, Hiram Douglas and others. I think at that time I may have been one of the only pilots flying a Pitts with one eye, if there were others, I don’t know about them. So, after 27 years and 8,000 flying hours in 30 different aircraft, I have type ratings on five different airplanes. I tell this story for people who think they might not be able to do certain things because of some sort of problem. This just isn’t so. All of the ratings and flying time I accrued was after the accident. Every place I worked was told about my having one eye. Not one ever had a problem with me working for them. There are many pilots out there with worse problems than mine. I have to mention one of my friends, John MacGuire. John flies Charlie Hilliard and Bevo Howard’s clip-wing Cub in air shows with only hand controls. 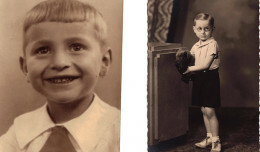 John was injured in a Pitts crash and lost the use of his legs. His injuries make mine seem small in comparison. So, don’t let problems you have stop you from doing what you want- there is always a way.